Green Peas Pulao or Matar Pulao is my favorite recipe in winter season, when fresh peas are abundantly available in market. 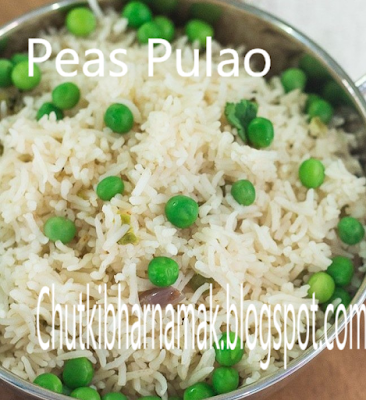 Green Peas Pulao or matar pulao is a complete meal in itself and its very delicious . It makes for a very tasty and delicious when you serve dal tadka and raita. YOU CAN FIND DIFFERENT TYPES OF Pulao IN MY BLOG.....LIKE gutta Pulao,SOYA PULAO etc. Take a heavy based pan, heat the ghee in a pan and add bay leaf, cardamom, cinnamon stick, and jeera , sauté for 1 min. Add chopped ginger and sauté ½ min, when ginger become little brown add soaked rice, peas and salt to taste. Stir all things and fry well. Now add 4 cups water and bring to a boil.